Basic Rose is an original crochet pattern by June Gilbank. This basic rose pattern is a perfect introduction to crocheted flowers, and it’s so versatile - make it in any size and colour you like! 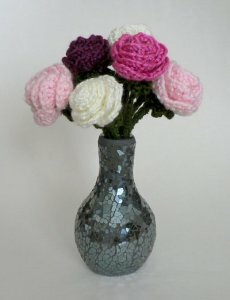 Additional info: You'll also need a pipe cleaners or length of floral wire to make the optional stems. Option: This pattern will work with any size yarn, provided you choose a suitable hook size for your yarn. For example, using size 8 perle cotton and a size 7 (1.5mm) hook produces a tiny 3/4″ diameter rose. Date Added: 09/03/2012 by Rebecca E.
Date Added: 01/27/2012 by Selene C.
Date Added: 07/27/2010 by Jacqueline B. Date Added: 06/05/2010 by Mackenzie K.
Date Added: 05/28/2010 by Tanya B. Date Added: 08/06/2009 by Virginia F.